Today’s report from Labour lays bare the human cost of Tory cuts. After almost eight years of cuts, local authorities are struggling to protect front-line services. By 2020, local government will face a £5.8 billion funding gap, placing even more pressure on councils to collect all of the Council Tax they are owed. In turn, this is placing even more pressure on those who fall into debt. Citizens Advice report that since 2013, the number of cases that they handle relating to council tax arrears has risen by 50% to around 217,000 each year, whilst the number of concerns relating to other taxes has fallen or flat-lined. 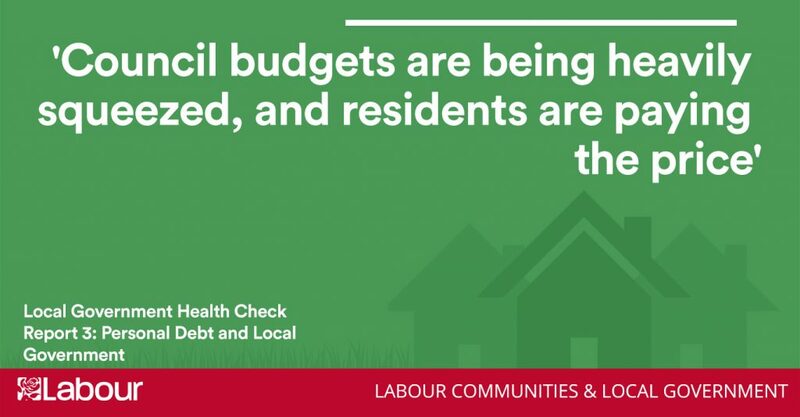 Labour’s health check report analyses the impact of austerity on council tax debt, and building on the best practice within the sector, offers suggestions for a new model for debt recovery. “Councils face a £5.8billion funding shortfall by 2020, which is why there is an increasing pressure for them to collect these funds. “For several years this has meant that debt advisers have been seeing more people having problems paying everyday bills such as council tax. Labour councils are already adopting ethical debt management practices, that are not only better for residents but saves money for taxpayers at a time of massive cuts.